Welcome to Day 13 of 31 Ways to Embrace Lopsided Living! sometimes things get a little bit chaotic. 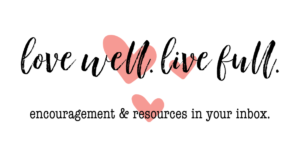 And sometimes in the chaos, a blog post doesn’t get written when you planned and instead you oversleep and are frantically writing it two hour after it’s normally posted. Wanna know how I know all that? Yes, today, is a day when I’m am truly practicing what I preach. Because today’s post is getting posted late (which you may or may not even notice but is hard for this perfectionist-leaning girl to accept). 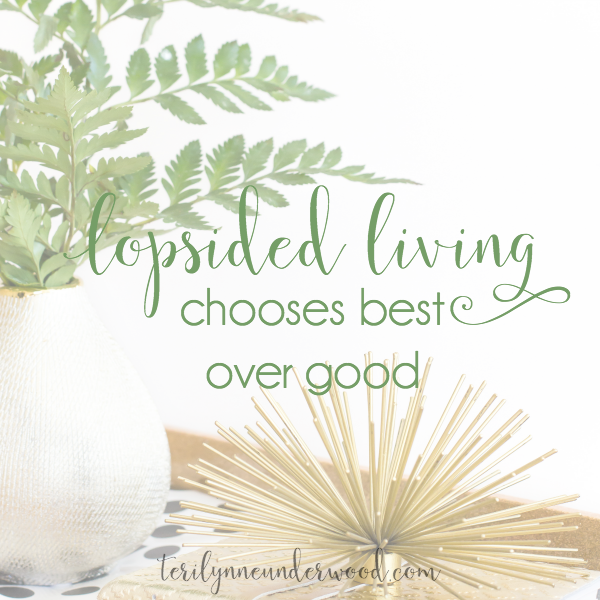 Lopsided Living chooses best over good. Anyway, since we live about 2.5 hours from Nashville, he didn’t get home until 1 a.m. yesterday. When he got home, we talked about the event and few other things before finally falling asleep around 2 a.m. Now is when I tell you, I truly need 8 hours of sleep in order to function. Seriously. So the four hours of sleep I actually got Tuesday night were, clearly, not enough. Yesterday I was in a bit of a fog most of the day and, while I did manage to check a few things off my list, writing a blog post was not one of them. I had planned to do it after church last night … but, my daughter and her AP Chemistry group needed my computer to finish up their midterm projects. At 10 p.m. I went to bed. Blog post not done. I set the alarm for 6 this morning — and slept through it (and the second alarm at 6:30). This series is super important to me. Encouraging women like me and you to embrace lopsided living brings me great joy and I want to be a voice of truth and grace where you can find hope. I want to give these posts my very best attention so they can truly encourage you and help you live lopsided. Life is like that, isn’t it? Every day we have to make choices and we want to do the best things over the good things and give our best efforts to the things that really matter. 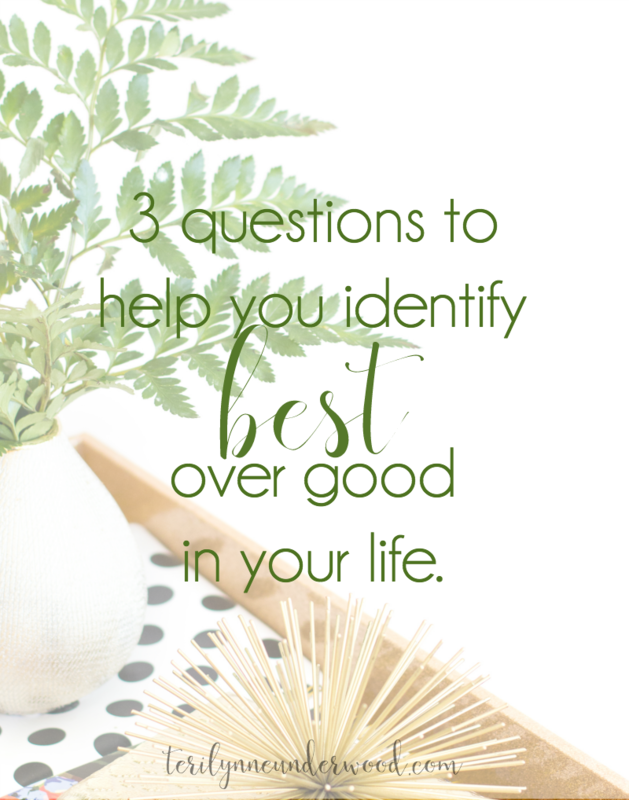 Here are three questions I often ask myself when I’m trying to sort out what is best in a sea of good or even really good. Which of the choices will most encourage my relationship with God? Will any of the options cause me to neglect the priority relationships in my life? Will choosing any of these options create conflict with my other commitments? Those aren’t the only questions we can ask, but I’ve found if the answer is yes to any one of the these, I’m typically better off saying no or not now. Staying up Tuesday night and letting the girls use my computer last night were the best choices — even though the result was a blog post written later than I prefer. When you choose to prioritize your relationship with God and the relationships you have with the most important people in your life, that honors Him! IDENTIFY THE PRIORITY PEOPLE IN YOUR LIFE. For me, those relationships include my husband, my daughter, our parents and aging grandparents, and my three closest friends. This doesn’t mean other people aren’t important to me and that I won’t do whatever I can to support, help, and encourage them. But, these are the relationships I give highest priority to after my relationship with the Lord. Knowing these has been a key to helping me set other priorities and know how to choose best over good. This doesn’t mean I don’t spend time with anyone else or that I’m not quick to help in a crisis. It simply means, day in and day out, these are the people I want to give my best attention too. I want to dig deep with these people and that requires time. Sometimes your best will look nothing like your BFF’s best. That’s okay. Sometimes your best may even look crazy to everyone else. That’s okay. When our hearts are focused on knowing God, loving Him, and loving others, we can walk confidently in the best and true abundance He has for us. Yesterday’s post (in case you missed it): Be where you are. Coming tomorrow: When good enough is enough.